Baking as a hobby leads to the inevitable: too much bread. A two-person household can only consume so much bread before it stales. (And a freezer can only hold so many wrapped loaves and rolls before it overflows.) I try to keep the bread tide in check by making breadcrumbs from time to time: I search out the oldest bread in the freezer, let it come to room temperature, and send it for a whirl in the food processor. Yesterday’s freezer purge yielded three whole wheat pistolettes, one cheese-filled crescent, and a single slice of flaxseed bread. Processed along with a coarsely chopped clove of garlic and a quarter cup each of grated pecorino romano and parmesan cheeses, the breads became seasoned crumbs crying out for a gratin dish. Fortunately, I had several fat eggplants, a little marinara sauce, and a dish just the right size…think of this gratin as a deconstructed, lower-fat eggplant parmesan sandwich. Combine fresh breadcrumbs, garlic, cheeses, and parsley leaves in a food processor; pulse until garlic is finely chopped. Reserve crumbs. Brush eggplant slices with olive oil and arrange in a single layer on two baking sheets. Bake at 375 until barely browned in spots; turn slices over and bake 5-8 minutes more. In an oval, 12″ gratin dish, spread 2-3 tablespoons of marinara sauce and arrange the eggplant slices, overlapping, to cover the tomato sauce. 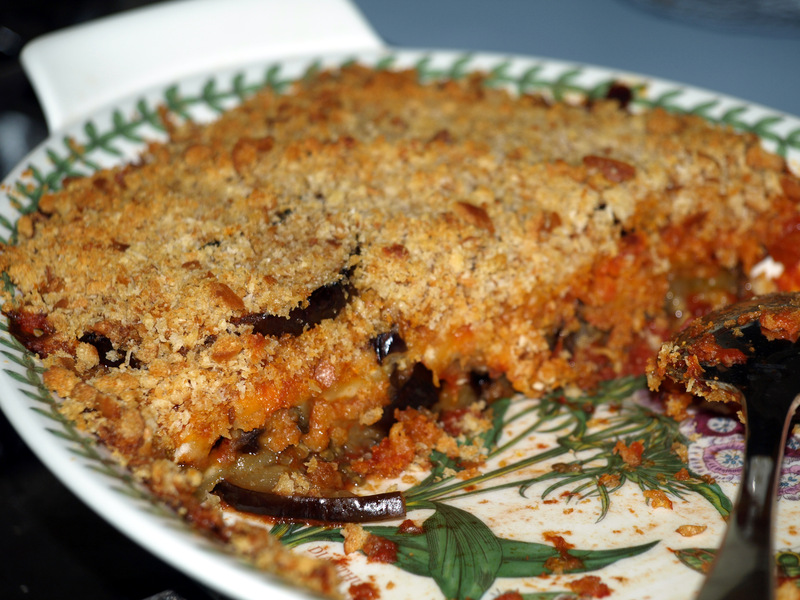 Spoon tomato sauce over the eggplant slices, then sprinkle 3/4 cup seasoned crumbs evenly across the layer. Repeat the eggplant, tomato sauce, and crumb layer. Bake at 350 for 20-30 minutes, until the crumb topping is well browned and the tomato sauce bubbles. Note: additional salt and/or peper may be necessary, depending on the kind of breads used for the crumbs and the level of seasoning in the tomato sauce.